I read my first Peter Carey book, His Illegal Self, earlier this year, and frankly speaking, I wasn’t overly impressed, despite some interesting characterisation, However, I thought it was only fair to give him another go, and I picked up a copy of Oscar and Lucinda on a recent library trip (my elder daughter, Emily, was distracted by something shiny for long enough to allow me a quick look around A-D). The verdict? Well worth a read. The story follows two lonely souls, English priest Oscar Hopkins and rich Australian orphan Lucinda Leplastrier, as they float along their early lives only to have them intersect and entwine under unusual circumstances. Both find themselves separated from their own kind by taste and circumstances, but it is a shared passion which brings them together: a love of gambling. When the beautiful and headstrong Lucinda reveals her secret to her new clerical acquaintance, she expects the usual disapproving response, especially from a man of the cloth. Instead, Oscar’s face lights up and he describes her vice in an entirely new light. As the unlikely couple cross paths repeatedly and eventually come closer, the obsessive and the compulsive gambler stake their futures on the outcome of a larger wager, the bet which will shape their futures. Alas, we know from the start, in the form of a series of teasing interjections from our narrator, Oscar’s great-grandson, that this is one gamble which is not going to come off. Oscar and Lucinda starts rather slowly, and the first couple of hundred pages didn’t really grab me. However, as the narrative gently ebbed forward, I became more and more involved with the odd couple and their intriguing story; by the end of the book, I was desperate to find out what had happened and how the beginning and end of the story came together. One of Carey’s strength is the descriptiveness of his writing. He lingers over scenes, painting vivid pictures of firesides, threadbare furniture and knotted floorboards, dust floating in the sunlight coursing through lead-framed window panes. Along with the way his characters are seen through many eyes, their own, their close friends and, occasionally those of minor characters, this attention to detail builds images in the reader’s mind until you can almost see Lucinda suppressing her rage when patronised by her workers at the glass factory or Oscar battling manfully on the high seas against his overwhelming phobia. 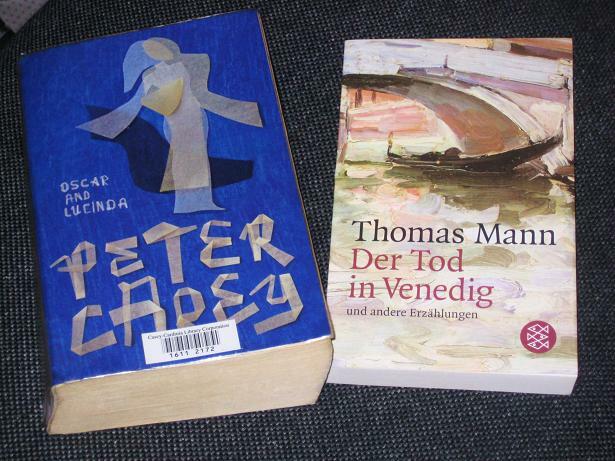 A few weeks ago, I posted on the first few stories from my Thomas Mann collection (although most people would probably not have realised that from the actual post itself), having taken a break half-way through from the unrelenting mental struggle of grappling with Mann’s language and concepts. Imagine then my delight when, on returning for the return bout, I found that the remaining two stories were whimsical, humorous retellings of ancient Eastern tales (obviously, Mann mellowed a little with age). What follows is a story inviting us to reflect on what makes us, well, us. As Sita struggles to decide who is her husband, Schridaman’s clever head or his slightly flabby body, we get to make up our mind about whether it is our animal impulses or higher instincts which control our decisions. Don’t worry, it’s not as high-flown as it sounds; in fact, at times, it is slightly farcical and extremely amusing – a far cry from the painstakingly excruciating agonies felt by Von Ascherbach in Der Tod in Venedig. The second story, Das Gesetz (The Law), is a retelling of part of the biblical story of Moses. While the gist of the story is fairly faithful, there are some variations from the original. One example is the portrayal of Moses as the son of an illegitimate tryst between an Egyptian princess and a Jewish waterbearer, with the baby being brought up by the father’s family, and not the royal household. Rather than being the stern, superhuman Charlton-Heston-like depiction of the saviour of the Jews, Moses is shown as a rough, tongue-tied holy man, who relies on the practical nous of a few choice followers to convert God’s will into achievable ideas. Joshua, a warlike lieutenant (who, it is suggested, was actually responsible for the tenth plague of Egypt), makes maps of the route to the Holy Land and considers deeply matters such as requisition of resources and the demographic growth required to usurp possible other claimants to Jewish settlements. Glad to hear you enjoyed Oscar and Lucinda! Peter Carey, in my opinion, reached his pinnacle with True History of the Kelly Gang (the other book for which he won the Booker) and his been going downhill since. (I haven't read his most recent outing but it's not receiving favourable reviews.) Check out True History, if you have the chance, and be warned that it will be a little difficult to read at first, but you'll get sucked in and it'll be more than worth it! I am planning to give it a go at some point (probably from the library – buying Australian books from the Book Depository in British editions just feels dirty somehow…). Now then Maloney. Don't forget Dominican author, Junot Diaz's The Brief Wondrous Life of Oscar Wao. Nice insight to Trujillo's rule. Another class act, is Mikail Bulgakov finest – The Master and The Margarita. Get your brain chops round that. A top new English talent is Tommy V with the novel I just Love the Rain. Thanks for visiting and commenting on my blog, “Complete and Unabridged”, and especially for your recommendations of German lit. I had no idea that “All Quiet on the Western Front” was part of a trilogy. Great to see that you are reading Thomas Mann. His “Buddenbrooks”is my next book just as soon as I finish Kafka's “The Trial”. Thanks 🙂 I'm heavily into German lit., and there aren't too many other bloggers around who read many of these books, whether translated or int he original (not in the English-speaking blogosphere anyway! ).